Posted on September 8, 2013 by David H.
Hunting Park, which is worth a visit, is a wide open area of green comprising about 87 acres in North Philadelphia, and while it has certainly changed through the years, it has always been filled with plants. Originally part of the James Logan estate (that included nearby Stenton), this particular parcel was sold in the early part of the 19th century and soon thereafter there was a racetrack here that was active and running up until the mid-1850s, when the land came to the city to be used as a park, and by 1937 Hunting Park had a “music pavilion, tennis courts, a lake, and a carrousel“. In 1872, the park came under the Fairmount Park Commission, and it stayed there until 2009, when the combination of the Fairmount Park System with the Department of Recreation made what is now Philadelphia Parks and Recreation, a department in the city that manages thousands of acres of natural lands, playgrounds, and much, much more, including Hunting Park. The lake there (mentioned above) was a wading lake, a lot of it less than knee deep, depending on the depth of your knees, and pretty much all of it below the waist, given that it was a “wading” lake, and it was huge – as can be seen in the aerial photo here, the lake stretched about a block and half’s length north to south, and about the same, roughly, from east to west, forming somewhat of a boomerang shape, pointing towards the west, with a smaller pool, perhaps for smaller children, at the northern tip of it. You can further get a sense of its size by the aerial photo here, from 1939. Also note from the 1843 map here that the site where Hunting Park is now didn’t have much in the way of streams or creeks running through it, which says that the lake most likely wasn’t a dammed waterway, but was more likely simply a large expanse dug down until groundwater was hit and that then filled the pond. The pavilion at the crook of the boomerang’s elbow, on its east side, is still there, but the lake is not. 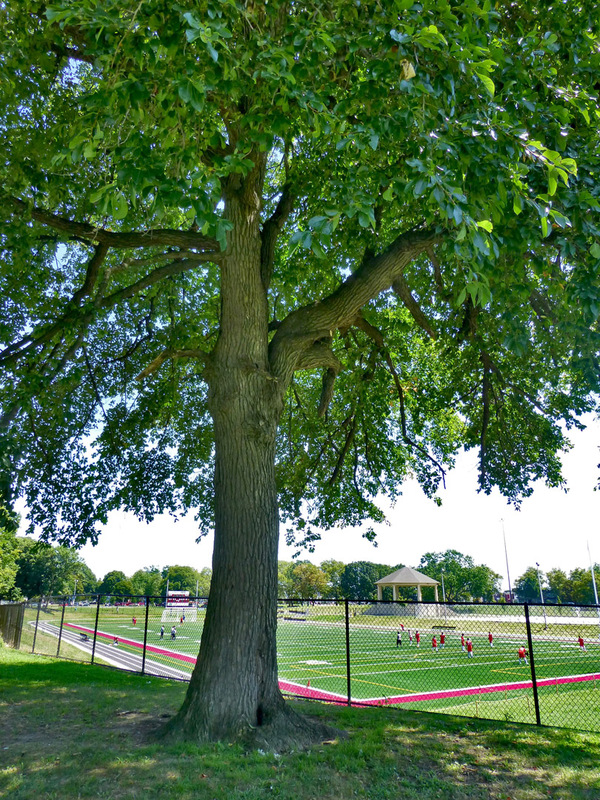 Given its size, this tree was mostly likely there when the lake was – shading bathers from the summer sun, and providing brilliant red foliage in the autumn to give a vivid signal of the end of the swimming season. In the 19th century, William Saunders, partner of Thomas Meehan (proprietor of the eponymous nursery, mentioned above), laid out a design for Hunting Park, and there are trees there still that look, from their size, to be from that time, and therefore perhaps from his design. There’s a huge sugar maple, for example, just to the east of the community garden, in the western part of the park, and oaks, including scarlet, red, and white, in the southern section of the park, all of which look to date from the late 19th century based on their heights and widths. It’s enormous, as you can tell from the apparently tiny people who are at the base that are, I can tell you, all over 5 feet tall, and some a fair bit more than that. Based on its size, we can pretty confidently say that it dates to the mid, if not early, 19th century, if not before, and it has accompanied the historic building (at the very southwest corner of the park) through the centuries, and through to today. Posted on June 22, 2012 by David H.
Cresheim Creek is a tributary of the Wissahickon, and where these two waterways meet is called Devil’s Pool. People have been swimming at Devil’s Pool for centuries, diving off the high rocks and into the deep pool below, having cookouts on the side, and sitting in the cool water on the hottest of summer days – it’s been like this for hundreds of years, cool water on a hot day has always drawn us to it, and probably always will. That cool water carousing out of Cresheim Creek runs down all the way from Montgomery County, where the headwaters of Cresheim spring forward, up near the USDA research facility on Mermaid Lane. That water quickly cuts into Philadelphia, running alongside an old Pennsylvania Railroad spur that came off of the Chestnut Hill West line, a spur jutting off that main branch, popping off in a northeasterly direction – its railbed then crosses Germantown Ave and ducks underneath a trestle of the Chestnut Hill East line, which was a Reading Railroad train. These lines and companies didn’t touch, but where they came close to each other, Cresheim Creek ran beneath them just the same. And while that old train bed along which Cresheim Creek flows doesn’t run rails anymore, it is still there, a remnant of a time when trains lined the city in far higher resolution than they do today, and of a time when they followed streams instead of piling over them. Thomas Moran’s painting Cresheim Glen, Wissahickon, Autumn captures how this waterway looked in the mid to late 19th century, with a white oak to one side (the viewer’s left), a sycamore to the other, tumbled rocks in the water, and a wide open space just beyond. As it rolls through Philadelphia, Cresheim Creek runs alongside Cresheim Valley Drive, cutting through deep rocks, and then into a wider plain. At about this opening, just southwest of the train bridge for the Chestnut Hill West line, there used to be a recreational lake, called Lake Surprise – this was there about a hundred years ago and is no longer there. Lake Surprise was constructed after factories upstream, like the Frances Carpet and Dye Works, had closed, thereby keeping the lake’s patrons unstained. Keller and Brown (1905), in their flora of Philadelphia, list a locality of “Wissahickon” for the paw paw, but it is not to be found in Jack Fogg’s checklist of plants of the Wissahickon (published in 1996 in Bartonia), and as just mentioned above, I haven’t seen it here (though it does grow elsewhere in Philadelphia today). And so the plants have changed – some that weren’t here historically are here now and some that were here previously no longer are. But the forest is still here, in a variety of different forms and structures. One spectacular stand of woody plants is up a hill that is somewhat steep, and not too far southwest from McCallum Street, and on the southeast side of the stream. There, there is a magnificent stand of mountain laurel, flowering in the spring underneath very large chestnut oaks. These might have been planted. They might not have been planted. But either way, they flower in the spring and as they shed their leaves in the fall they leave behind magnificently crooked branches straggling towards the canopy above. A little bit farther downstream from there, downstream from that stand of mountain laurel and chestnut oak, but before you get to the Devil’s Pool where Cresheim Creek empties into the Wissahickon, there is a dense stand of eastern white pines (Pinus strobus), a stand filled with very large trees. Many, if not most, of them are well over 2 feet across and tower a hundred plus feet over your head as you walk among them. It is a uniform stand of trees, pretty much all white pines, with their soft needles making for quiet walking along the paths that wander over their roots, and very little underbrush to block your way. I’ve been coming to Cresheim for years, and this site is one of the most striking there – and for many years, I’d thought of it as a scene right out of pre-colonial Philadelphia, before there was a Philadelphia. This was how it must have looked, I thought. Enormous white pines, tall like the ship masts they would’ve become if this were three hundred years ago, filling in the woodland scene. White tailed deer would’ve run beneath, turkeys would’ve gobbled in there, too – this would’ve been nature at its cleanest, its purest, its finest. This is how Cresheim Creek must’ve been , I thought, and how much of the Wissahickon would’ve looked before we got here. But that’s not how it would have been, not even close. Unknown to me then but known to me now is that the white pine is not native to Philadelphia. While it is native to Pennsylvania, it is not native to our city – it was not here, most likely, when Europeans arrived, and it quite certainly didn’t fill thickly the woods with uniform stands, like this stand at Cresheim Creek does today. How do we know this? Well, one reference to use to answer this kind of question is William P. C. Barton’s Compendium Florae Philadelphicae, written in 1818. Dr. Barton was the nephew of Benjamin Smith Barton, the man who trained Meriwether Lewis in botany, and the younger Barton was also a botanist, at the University of Pennsylvania, just like his uncle. And he (William P. C., that is) wrote a book that listed all the plants in Philadelphia at his time. Pitch pine (Pinus rigida) is there, and even noted as being “on the Wissahickon”. So is what was called at the time yellow pine, but we now call short leaf pine (Pinus echinata – though Barton calls in Pinus variabilis). But the eastern white pine, Pinus strobus, is not there, it is not listed in Barton’s flora of Philadelphia. And so we can reasonably confidently say that this tree was not here in 1818. Addtionally, Peter Kalm, Finnish botanist and student of Linnaeus, when he was here in the late 1740s, he didn’t see it, though he did see it in Albany in June 1749, writing “The White Pine is found abundant here, in such places where common pines grow in Europe. I have never seen them in the lower parts of the province of New York, nor in New Jersey and Pennsylvania.” (Travels into North America, by Peter Kalm, translated by John Reinhold Forster); he most likely would have noted such a valuable tree, and where it was, and so this is further evidence that this tree wasn’t here. (this was a tree of great value, so great that in 1710 there was passed in England: “An Act for the preservation of white and other pine-trees growing in Her Majesties colonies of New-Hampshire, the Massachusets-Bay, and province of Main [sic], Rhode-Island, and Providence-Plantation, the Narraganset country, or Kings-Province, and Connecticut in New-England, and New-York, and New-Jersey, in America, for the masting Her Majesties navy “) Additionally, in Ida A. Keller and Stewardson Brown’s 1905 Handbook of the Flora of Philadelphia and Vicinity, published by the Philadelphia Botanical Club, they do list the eastern white pine, and note it as being present in Bucks County, and Montgomery County, and Delaware County, and Chester County, and Lancaster County, and Lehigh County – throughout southeastern Pennsylvania, you’ll note. Except in Philadelphia. And in Thomas C. Porter’s 1903 Flora of Pennsylvania, he lists it as being in Chester and Lancaster and Blair and Huntingdon and Montour and Erie and Tioga and Delaware and Luzerne and York and Allegheny counties. But not Philadelphia. And so, the evidence points pretty clearly to the eastern white pine, Pinus strobus, as not being native to Philadelphia County. We do see it growing naturalized here now, but it got here, to Philadelphia, with our help. It isn’t clear when it became naturalized (that is, reproducing and growing on its own) here, though it is pretty clear that this occurred by the 1960s. It is in Edgar Wherry’s “A check-list of the flora of Philadelphia County, Pennsylvania” (published in Bartonia, the Journal of the Philadelphia Botanical Club, vol. 38), and this came out in 1969, and there is a collection of Pinus strobus from Dr. Wherry in the herbarium of the botany department of the Academy of Natural Sciences (PH) with label data stating: “Seedling from old (though probably planted) tree, Schuylkill Valley Nature Center, 1 mile west of Shawmont / October 27, 1967” (NB: this is the only collection of P. strobus from Philadelphia at PH, and I also note that there are none from Philadelphia at GH; I looked in June of 2013. There are three listed in the NYBG online database, one collected by Isaac Martindale, July 1865, in Byberry, but it is not noted if it was cultivated (NB: Martindale commonly collected in gardens, as is noted in Meyer and Elsasser 1973 [“The 19th Century Herbarium of Isaac C. Martindale”, Taxon 22(4): 375-404]: “His earliest collections date from 1860 when he started to collect plants in his garden and environs of Byberry and from the garden of his uncle, Dr. Isaac Comly, who also lived at Byberry. Martindale left a fairly good record of cultivated plants of the Bartram garden in Philadelphia, of Thomas Meehan’s nursery in Germantown, Pennsylvania, from his own garden, and from other gardens in the Philadelphia area.”; additionally, this species has been commonly planted in the region for quite some time, e.g, as is noted in William Darlington’s 1826 Florula Cestrica, of Pinus strobus: “This is a handsome tree; and when met with, is generally transplanted about houses, as an ornament.” – he also notes it as being ‘rare’ [this refers to Chester County, PA]); there are two additional collections of P. strobus from Philadelphia, at NYBG: two duplicates of var. “fastigiata”, collected in 1980 and noted as being cultivated). Also, in the archives of the Academy of Natural Sciences, there is a document, by Charles Eastwick Smith, a “Catalog of the phaenogamous and acrogenous plants (found within 15 miles of Broad and Market streets, Phila., and in the herbarium of C. E. S.)” … “found in 1860-1868”, and in it P. strobus (on p. 24) has a dash next to it, indicating its presence within that range at that time; however, there is no indication if it was in Philadelphia, or just nearby. And this stand itself has been documented as being planted, by J. C. Tracy, in his paper “the Breeding Birds of the Cresheim Valley in Philadelphia, 1942“, published in Cassinia, where he writes “Near the mouth of the creek a large stand of white pine has been introduced on the south slope.” Also, in Norman Taylor’s 1915 Flora of the Vicinity of New York, which includes Philadelphia, he notes of the range of P. strobus: “PA. Throughout”, but he doesn’t site any specimens or give details as to whether it was specifically found in Philadelphia; and so while this suggest that the white pine might have been naturalized here by 1915, it doesn’t suggest it strongly, and so it is as yet unclear as to when exactly this tree became naturalized in Philadelphia. But anyway… by the sixties it’s pretty clearly documented that it was naturalized here. But it most likely was not in the 19th century, the earliest 20th century, or before. Additionally, this stand in Cresheim Creek is an even-aged stand, most of them being about the same size (and therefore, by inference, all being roughly the same age), and most of them are on a hill, sometimes a pretty steep one. The white pine stand in Cresheim Creek is roughly a hundred years old, and now, perhaps, it is clear why that “roughly” becomes interesting. It is now 2012. In October 2011, we cored a couple of trees in the white pine stand along Cresheim Creek (by “we” I mean John Vencius, Ned Barnard and me). For those two trees, we got, respectively: ages of 95 +/- years (dbh [diameter at breast height]: 29.3 inches) and 80 +/- years (25.5″ dbh). This puts the older one at right in the midst of the time when white pines were rarely planted, and right around the time when imports were banned. Coring of trees, like all endeavors scientific and otherwise, is not absolutely accurate – there is error associated with all measurements, and so we measure multiple times, and we measure multiple points, so that we can asymptote to reality. Therefore, at this point, with so few data points, we can only roughly say when this stand was planted – about a hundred years ago. And it leads us, or leads me at least, to ask some questions: Was this stand planted with seedlings imported from Germany? If so was it one of, if not the, last one planted in Philadelphia with imported seedlings? Or was it planted with seedlings produced domestically? If so, was it one of, if not the, first stands planted with domestically produced seedlings? I don’t know, and we don’t know, the answers to these questions, yet. If we knew everything, then researchers would all be out of work , and so, fortunately, there are always questions to ask, and there always will be, as long as there’s people to ask them. We’ll be looking at more of the trees in that stand, to see how old they are, and also looking for archival documentation of this stand’s planting, to see more closely when it was sown, to see on which side of the great divide of 1912 these plantings occurred. There’s always questions to be asked, and often, too, there are answers to be had. We’ll see what those answers are, as they arrive. There is a larger question, however, that arises from these trees, I think, and that question is – what is natural? This stand of white pines in Cresheim Creek sits in the midst of Philadelphia, one of the largest cities in North America, and if most people were to walk among these trees, they would see it as an inspiring piece of nature’s work that somehow survives the urban impacts around it. After hearing that it is planted with a species of tree that is not native to Philadelphia, and that this stand was quite possibly planted with seedlings imported from thousands of miles and across an ocean away, and most certainly was planted with nursery grown seedlings from somewhere, and that it was quite likely planted for engineered erosion control, they might feel differently, might not feel that it’s natural. But these trees are here, and they are growing. They were planted a hundred years ago, or so – before I was born, before my parents were born, they were here. They’ll most likely be here long after I’m gone, too. Birds fly among them, squirrels climb in their branches, people walk under them. They’re seeding in offspring, seedlings coming up at their parents’ feet – being naturalized is in their nature. Someone, or more likely, someones, put them there, but now they thrive and survive on their own, set into an area along a creek that was a major industrial site, but no longer is, in the midst of one of the largest cities in the country, in a city that is thoroughly carpeted with concrete, this lush green forest rises above carpets of its own leaves, and you wouldn’t know its nature unless you looked very closely, at which point you see that this stand has created a little world all its own, and does make us think that, in this world, there’s a lot of ways to be natural. 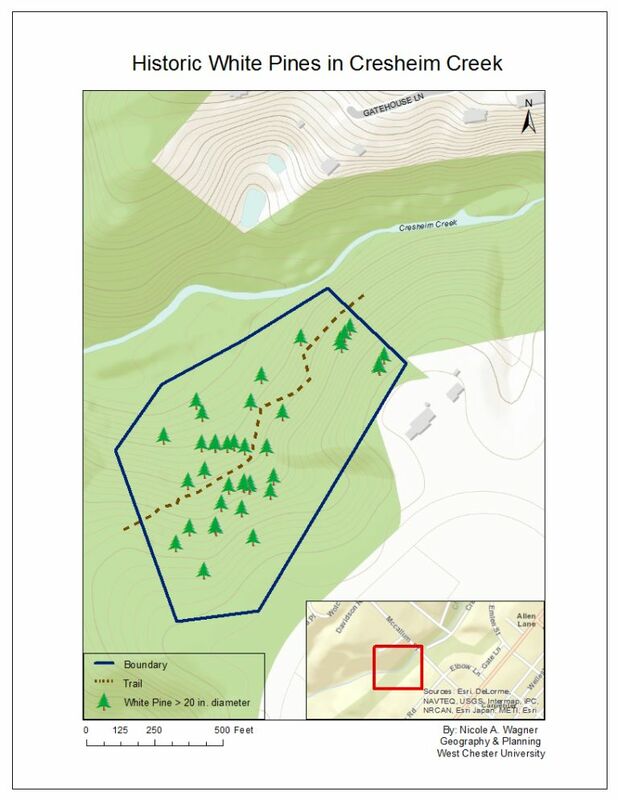 Map by Nicole Wagner, graduate student in Geography and Planning, West Chester University, of the white pine stand along Cresheim Creek. Posted on June 8, 2012 by David H.
What is the only plant that is mentioned twice? It is the chestnut – the American chestnut (Castanea dentata), specifically. This was a tree of such value that William Penn mentions it twice in his relatively brief letter (or ‘advertisement’ more accurately – he very much wanted people to come over and live in Pennsylvania, and so he was playing up the highlights for that cause, and so this truly was advertising) that he sent back home to England, at a time when correspondence was not as cheap as it is now, a time when every word would have been dear and measured. Among the treasures of the new world, the chestnut shone brightly. These nuts were of extremely high quality, and economic value, too – people would go out to parks and forests to collect them by the basket and the bushel – sometimes they would eat them, other times they would sell them, but every year they would gather them. And other animals, in addition to humans, ate chestnuts, too – they would have been a regular supply of high energy (they are quite fatty) food for squirrels, for deer, for passenger pigeons – for all kinds of animals that need such food in the fall. Yes, these animals would have also eaten acorns, but oak trees, from which those acorns fall, yield nuts irregularly – some years they are plentiful (in “mast years”), and in others they are not. And so the regular supply of the chestnuts would have regularly provisioned, at a steadier pace than the oaks, these animals – animals which, in turn, would have regularly provisioned the people who ate those animals. And there were other values to be derived from the chestnut – Michaux notes that “The wood is strong, elastic, and capable of enduring the succession of dryness and moisture” and so it was valuable for posts, rails, and shingles. Even two hundred years ago, there was concern about scarcity of energy sources, and the chestnut was seen as one of the feedstock solutions to that everpresent problem. Chestnut is especially useful for charcoal because it can be coppiced – that is, after the top part of the tree is cut back, suckers will grow up from the root crown, making new trunks where the old one had been cut off. This could be done every sixteen years or so, according to Michaux, to make for a renewable source of wood for coal production. But the utility of the chestnut didn’t end with food, fuel, and housing – it even extended to clothing. Not directly, of course – the colonists and early Americans weren’t going around dressed like Great Birnam Wood – but the bark could be, and was, used to tan leather. Fresh leather is not, as you might expect, ready to wear. It needs to be treated to prevent it from rotting – that is, it needs to be tanned. And the bark of chestnut trees are rich in tannins, chemicals that interact with the proteins in leather to alter them into a form that is less digestible to microbes (that is, it makes them resistant to rotting). And so, an early method of tanning was to take the bark of a tree rich in tannins, such as the chestnut (hemlock bark was also commonly used – more commonly than the chestnut, actually), toss that bark into a pit filled with water, let the tannins leach out of the bark and into the water, and then toss the leather into that solution, and then wait until the leather was tanned and resistant to rot, and, then… pret a porter! This tree, the chestnut, was the five and dime of early America – the fruits were good to eat, even better than their counterparts from Europe – the wood could be used for making fences and roofs and rails – the wood could also be made into charcoal to serve evergrowing energy needs – the bark could be used for tanning leather. It was the one stop shop for an extensive list of a colonist’s or early American’s household needs, wants, and desires. And it was everywhere, like a Woolworth’s on every corner. Now, however, it is not. So what happened? It’s not totally clear how this disease arrived initially – it is originally from Asia, and could have come in on material imported from there to the US, but however it got here, it arrived, and was first reported from the Bronx Zoo in 1904, and within a few years it had already spread to Connecticut, to Massachusetts, to Maryland – its distribution was rapidly fanning out, like mold on an orange. The causative agent of the blight was isolated and described shortly after the disease was discovered – William Murrill, a New York mycologist, did this in 1905, and named the disease Endothia parasitica (though we now call it Cryphonectria parasitica), but just knowing what it was, was not enough. The disease still spread. About ten years later, Frank Meyer, the Dutch plant explorer who worked for the US Department of Agriculture collecting plants in Asia, found this fungus in China, and then a bit later in Japan – it was found to live reasonably benignly with the chestnut species that live there, in Asia, and the geographic origin of the blight was now known. But just knowing where it was from was not enough. The disease still spread. As the blight moved onward, the chestnuts died back – and other trees grew up to take their place. This was documented in work done by, among others, Joseph Illick (Chief of Information of the Pennsylvania Department of Forest and Waters), and also other foresters such as C. F. Korstian and Paul W. Stickel, who wrote about their research in a 1927 article, “The natural replacement of blight-killed chestnut in the hardwood forests of the northeast”. The title alone tells you the impact that Cryphonectria parasitica had. As these researcher saw the blight remove the chestnut from the forests, they, as foresters, needed to see what trees would grow up to replace this enormously valuable tree. Would they be replaced by class 1 desirable species? Would they be replaced by class 3 undesirable species? Or by species inbetween? To find this out, they went out and looked to see what was coming in as the chestnut was going out. And they found that the chestnuts were being replaced mostly by oaks, such as the red, white and black oaks, among others, including the chestnut oak, and also by some other kinds of trees – hickory, white ash, sugar maple, sweet (black) birch. These trees were, mostly, what these foresters considered to be “Class 1 – Desirable species”, useful for forest products – perhaps not quite to the level of the chestnut, but useful still, for products useful to people. And so, while the chestnut would no longer be what it once was, the forest would still be there, as would the foresters. The chestnut was a tree that, as late as 1907, Samuel B. Green would write in his Principles of American Forestry (a book I stumbled across while perusing the stacks at the library of the Academy of Natural Sciences) was “One of the most beautiful of our forest trees. Prefers a rich, deep soil. A rapid grower and highly esteemed ornamental tree. Does well under cultivation.” Shortly thereafter, this was no longer to be. This is not to say it wholly disappeared – its wood’s durability, as noted above from Michaux, made it so that the wood lasted for decades lying in the forest, even after the trees had fallen. And its ability to grow from suckers has made it so that it persists even to this day – suckers grow up, die back from the blight, and suckers arise once again – never getting to the size of a full size tree, but surviving nonetheless. But the chestnut was no longer the dominant tree of the eastern North American forests. And it wasn’t just in the woods that the chestnut was fading away – this is also a tree that had been widely planted – a tree of such value certainly would not have escaped cultivation, and it was commonly planted and grown, and a pretty inexpensive tree to buy, too. As a visit to the McLean Library at the Pennsylvania Horticultural Society, and lots of help from Janet Evans, the librarian at the McLean, lets us know – the chestnut was cheap and plentiful in the horticultural trade, as we see from its history in nursery catalogs. In 1858, they sold for 50 cents a piece – and in the Fall 1880 catalog, they went for 10 cents a piece, 50 cents for ten, and $3 per hundred for 1 to 2 footers, and 50 cents a piece for 6 footers – while other trees might have been as cheap, none were sold for less, attesting to the ease of propagation and volume of sale of this plant. This continues onwards as the 19th century unfurled – in the spring of 1885 they were 50 cents a piece – the cheapest of the chestnuts listed (chinqapin, spanish, and japanese chestnuts were also listed). In 1893 and in 1895 its price and rank were still the same. Also, these 1890s catalogs note: “This leads all the sorts in the quality of its nuts and its valuable timber” – the chestnut was not just some easy to grow tree, it was also supremely sublime as to the value it provided with respect to food and shelter. And onwards on – in 1900 the listing includes a mention of “Our native wild Chestnut, so well known and appreciated” – this tree appealed to patriotism as well as its many other valuable qualities. It was an American tree – Longfellow wrote about how “Under a spreading chestnut-tree / The village smithy stands.” For the homeowner at the turn towards the 20th century, they most likely would not have been a smith, except perhaps by name, but they quite likely would have been wanting to harken towards the nationalistic pride and small town imaginings to which a native American plant would have given rise. The American chestnut continues on in the Meehan’s catalog, into the 20th century it went, setting sale just as it had in the 19th – and in the 1905 catalog, after the chestnut blight had been discovered in New York in 1904, this disease is not mentioned, they did not know what was to come. Before I continue on, I would like to say that crucial information in the following paragraphs was supplied by Marie Long of the LuEsther T. Mertz Library of the New York Botanical Garden; and Marty Schlabach, of the Mann Library (Cornell) in Ithaca, NY; and Lynn Stanko of the National Agricultural Library (USDA), in Washington, DC; and Kathy Allen, of the University of Minnesota’s Anderson Horticultural Library – and I was able to reach out to such talented and knowledgeable people because of Janet Evans, who made this research possible. It is not in the 1912, 1913, or 1914 catalogs – it was sold no more. How did this happen so suddenly? I was able to ask and answer this question quickly and efficiently because of access to great libraries – the McLean Library at PHS, as mentioned above, and also the library of the Academy of Natural Sciences with guidance, as is so often needed, by skilled librarians and archivists. In the Academy’s collections I found Bulletin No. 1 of the Pennsylvania Chestnut Tree Blight Commission (an organization that was conveniently located on Chestnut Street, in downtown Philadelphia, by the way), which came out in October 1912. This first bulletin was titled “The Chestnut Blight Disease – means of identification, remedies suggested and need of co-operation to control and eradicate the blight.” It covered just what it promised and gives an overview of the chestnut problem, up to that point in time. And what was in that legislation that affected Meehan’s nursery? Whether this legislation affected Meehan’s because their stock was infected, or if it just simply became too expensive to treat and inspect (and to take the time to do so) each plant, and to destroy suspect stock, I do not know. But with a sudden stop, and barely an audible gasp, the American chestnut was gone from Meehan’s catalog, never to return. There are still some chestnuts in Philadelphia. I don’t see them as often here as I did in New England (for example, the Hapgood Wright Town Forest, in Concord, Massachusetts has loads of them – small and scrubby and infected with the blight, but there nonetheless). I haven’t seen a single one along Cresheim Creek, a creek that runs into the Wissahickon, and divides Chestnut Hill from Mt. Airy, though I know they were there historically. We did see one up by Forbidden Drive recently, just below Bell’s Mill Road – a scraggly shrub that Marion Homes pointed out on a Philadelphia Botanical Club visit there a few weeks ago. And there are some that are planted here in Philadelphia – one is at Bartram’s Garden, and there are a couple at Independence Square and another at Washington Square, that Susan Edens has shown me. But it is not the dominant tree it once was, not even close. A few years ago, I was walking through the National Gallery, in Washington, DC, ambling around the rooms with the 19th century American paintings. Among the Morans and the Coles and the Cropseys, was this painting, October, by William Trost Richards. I was standing there looking at it, thinking about what plants were in that scene, and looking at the large tree on the right side of the painting – its leaves look like a beech, a tree that’s commonly seen in the woods of eastern North America, but the bark of this painted tree is extremely different from that of the beech, and so that clearly was not what this was. I was looking at it, and looking and looking and I really just could not think of what it was – I’m reasonably familiar with the trees of the eastern forests, but this one had me stumped, so to speak. Until I realized that it was a chestnut. An American chestnut – a tree I had never seen before at this enormous size, or even close to it. And I also realized that this was a scene I would never see. I’ve been in chestnut groves in Italy, and they are majestic. I have seen many small trees and suckers of the American chestnut, especially when I was up in New England. But something I will never see, except in paintings, or in very old photographs, is a full grown Castanea dentata in an American forest. It is gone, times have changed – oaks, and other kinds of trees, have filled in the space laid open by the passing of the chestnut, and so the forest remains. But the chestnut, as the lord of the forest, does not. It remains, yes, as a scrabbling shrub or spindly tree, but its dominance is gone, and in my lifetime, or even the lifetime of anyone born today, it will not return to its former heights. Its place left open for others to take it, the chestnut has become a minor piece of the current sylvic puzzle – the forest remains but the trees change, and the chestnut has lost its dominance. But the forest remains. Posted on April 22, 2012 by David H.
Paulownia trees are blossoming across the city now. If you ride the El to Frankford, northeast out from center city, and you look out over the rooftops, you’ll see bright purple flowers growing on trees, all the way along the way, coming up in vacant lots, or in backyards, or from cracks in buildings high above the ground, or from cracks in the sidewalk down among the feet, with pretty much all of those trees having gotten where they are on their own, or with just the help of the wind. Or, if you walk the Benjamin Franklin Parkway northwest out from City Hall, you’ll also pass Paulownias there – these ones planted by people, in Logan Circle, halfway up the way to the Art Museum, and though having arrived there with help from humans, they also, just as well, are flowering fully in profusion here in Philadelphia, now. Anywhere they can get a hold, the Paulownia trees will grow, and the Paulownia trees will blossom, usually in May, or also in April, as they are doing this year. This tree was originally from Japan, and arrived in Britain in 1840, having arrived in France a few years prior to that. The Paulownia got there because of Philip Franz von Siebold, and it was named for Anna Palowna, the hereditary Princess of the Netherlands, who was also the daughter of the Empress of Russia. And so it was an empress tree from the very beginning of its nomenclatural life. Philip Franz von Siebold was a physician from what is now the south of Germany, who worked for the Dutch military in the far east. Working in Japan in the early part of the 19th century, he was at first restricted in his ability to leave his post and travel around the country because Japan was mostly closed to westerners at the time, but his medical skills ultimately gave him access to areas that others did not have – and so he was able to indulge his passion for natural history, in addition to others. Taking full advantage of this capacity to collect, Siebold sent back plants and plants and plants upon plants, sending them back home to Europe, and one of those plants was the Paulownia. And so the Paulownia arrived in France in the 1830s. Daniel J. Browne, in his 1846 Trees of America, notes that the Paulownia was in the Jardin des Plantes, in Paris, and had hit a height of twenty feet by 1842, with leaves two feet in diameter, and had survived the winter of 1838-1839 “without any covering”. It had arrived, survived, and thrived. The Paulownia arrived in America soon thereafter. Daniel Browne (again writing in his 1846 Trees of America) says the introduction of Paulownia to the US was via Parson’s in 1843. Its presence at the Parson’s Nursery in Queens (NYC) by 1843 is noted in the American Agriculturalist of August 1843, and so we can be reasonably sure it was there, but it most likely also came into the US via other avenues as well. And so it sounds as though it arrived in Boston at about the same time it would’ve gotten to Parson’s. 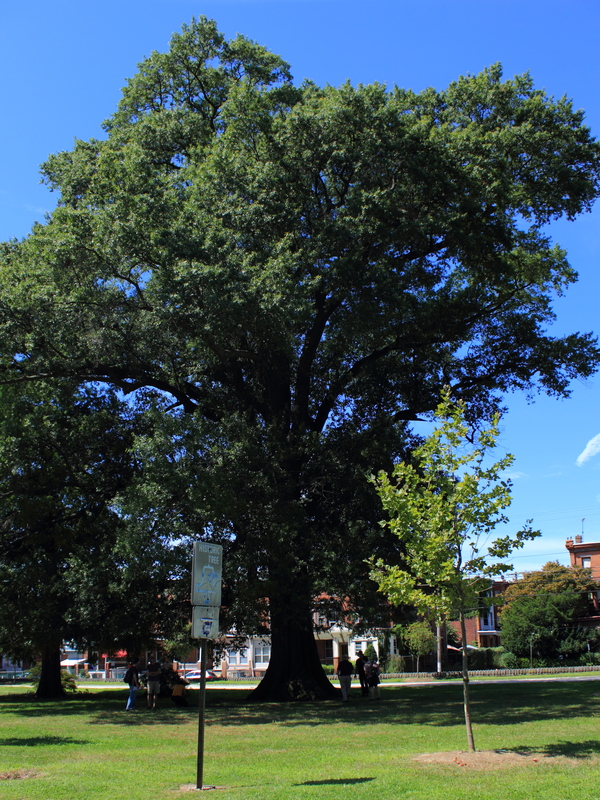 This tree’s speedy growth is something that Thomas Meehan noted in his American Handbook of Ornamental Trees, writing that “It is as rapid a grower as the ailanthus, the wood and trunk of the tree also resembling it”, in 1853. Downing noticed its amazingly fast growth, too – “In rich soils near Paris it has produced shoots in a single season 12 or 14 feet in length.” – but given that rapid expansion who wouldn’t have noticed how speedy it grew? Downing also records the Paulownia’s flowering time as being about the same as now, “Its flower buds open during the last of April or early in May…” and also that it was “yet very rare”. But at this point, no one really knew the plant, and just how large and fast it could grow – Joseph Breck wrote in his Breck’s Book of Flowers in 1851: “To all appearances it will not grow to a very large size in our climate”. At its earliest days in the occident, as you might expect, the attributes of this tree were unknown – again from his Book of Flowers in 1851, Breck quotes Andrew Jackson Downing as writing: “When the Paulownia was first introduced into the Garden of Plants, at Paris, it was treated as a delicate green house plant. It was soon found, however, that it was perfectly hardy on the Continent and in England.” Nobody at that time knew just how well this tree could grow in the temperate cities of Europe and North America, but they tried it out nonetheless, and found it to be able. Very able. The Paulownia, early on after its first introduction into the west, was seen as having enormous potential for horticulture, being a tough, fast growing tree with beautiful flowers, and it was predicted that it would soon be everywhere. We, today, here in Philadelphia, had a mild winter this past year, perhaps providing us with pretty much the same thing as Meehan saw in the fall of 1882. A mild winter that would have led to less frost and cold damage to the overwintering buds means we may well be seeing more blooms than usual this year, in 2012, due to last year’s warm wintry months. There were other concerns – in another issue of Meehan’s Gardener’s Monthly from 1865 (volume VII, no. 2), Thomas Meehan also recommends “Paulownia, for those who like sweet or showy flowers regardless of an ugly growth.” So the habit was not necessarily considered attractive. But into the 20th century, the Paulownia was still fully able to take a place of prominence. In the 1920s, in Philadelphia, when Logan Circle was set out with plants, this circle having been placed in the midst of the Benjamin Franklin Parkway, the grand boulevard that is our own Champs Élysées, our own reminiscence of France, of Paris, this parkway that is the Philadelphia passage from city to parkland, designed by Paul Philippe Cret to be our cultural boulevard stretching outwards from the center of our town to the heavens of art and nature – when Logan Circle was set like a gem within this diagonal jewelry of a drive, it was set with trees, and those trees were Paulownias. And those trees lasted for decades – every spring sharing their blooms with the Parkway, and with the Academy of Natural Sciences right across the street, and with the main branch of the Philadelphia Free Library right there on the other side. These trees were taken down a few years ago, due to concerns related to their old age, and they were replaced shortly thereafter with new Paulownias, and those are the ones that are blooming there now. But, however, to get back to the past, there were additional problems noted of the Paulownia, in addition to its “ugly growth” and the potential loss of its blooms due to too cold winters or late frosts – something that made this tree so attractive early on, its ability to thrive and survive in our climate, and more precisely in human constructed habitats in our climates, also gave it the potential to spread wildly in our cities, and, perhaps more of a cause for concern, to spread in yards and nearby uncultivated areas. By 1905, it had “Escaped from cultivation”, as was noted in Ida Keller and Stewardson Brown’s “Handbook of the Flora of Philadelphia and Vicinity”, and even earlier, Nathaniel Lord Britton, in his 1901 “Manual of the Flora of the Northern States and Canada” mentions that Paulownia had “Escaped from cultivation N. Y. and N. J. to D. C. and Ga.” (the similarity in wording between Keller and Brown and Britton is not coincidental, by the way – Keller and Brown cite Britton’s Manual as their source, and also I transcribed the Britton commentary from Brown’s copy of the Manual, that he (Brown) had bought in 1901, fresh off the press – that copy is now at the Academy of Natural Sciences). And by the 1920s, there were localities where it had fully filled in – such as occurred in northwest Philadelphia: “More than twenty years ago the late Alexander MacElwee collected the Bird Cherry in the northwestern part of Philadelphia, along Gorgas Lane in Germantown. In 1921 there was an opportunity with Mr. MacElwee’s assistance to re-explore this region which is near the head of Wingohocking Creek. He selected a position along the Philadelphia and Reading Railway just northwest of where Washington Lane Station is now located as probably the spot where he made his collection in 1899. Here, escaped the processes of “improvement,” are still remnants of natural woodland, now, however, filled up solidly in many places with the Empress Tree and the Gray Birch (a naturalized species here), as well as with an equally weedy growth of the Wild Black Cherry. Seedlings of the Bird Cherry and young trees up to six or seven feet high may be found scattered through the woodlands for at least a quarter mile. Near a picturesque, ruined old springhouse in these woods is a thirty-foot tree of the Bird Cherry. The large size and the proximity to the springhouse suggest the possibility of its being a relic of cultivation and the “mother tree” of the Bird Cherries in this vicinity.” (from Bayard Long’s “Naturalized Occurrence of Prunus padus in America”, Rhodora vol. 25, October 1923); I note that this is just northwest of where Meehan’s Nursery was, as one can see in a 1910 map, and that the above cited paper came out just before that nursery closed. And so, as time rolled on, the Paulownia fell from favor for many in horticulture – Michael Dirr in his Encyclopedia of Trees and Shrubs (2011) calls it a “total loser” (“In the standard frame of reference for shade trees”, at least). In the 1980s, the Paulownia was still being sold, such as here. Its extraordinarily rapid growth was still a selling point, as were its brilliant flowers. And its valuable wood made it a target for criminals, such as the case of the “Fairmount Park chainsaw massacre” that was reported in the Philadelphia Inquirer on the 20th of May, 1983. The prior year and a half had seen a spate of Paulownia thievery, with rustlers cutting down the trees to sell the wood in Japan to be used for “bridal trousseau chests, jewelry boxes and coffins.” This happened at least four times, with up to dozens of Paulownias being taken down – and in broad daylight, too. One arrest was made at 9:30AM on the 9th of May (in 1983). In the Inquirer report of the above story, William Mifflin, the horticulturalist for Fairmount Park at the time, is quoted as saying that the Paulownia had never been planted intentionally by city landscapers and that the tree was introduced because its seeds were used as packing for porcelain shipped from China and that those seeds were then discarded as the packages were unpacked, thereby disseminating the seeds. None of those trees encircling that fountain were ever stolen, so far as I’m aware. They were also all planted there. And so there were, and are, a number of problems with growing Paulownias – they grow too fast, they flower too early, their wood proves too tempting for thieves… from its initial high hopes upon its introduction, reality intruded and the Paulownia, the empress tree named for royalty, has been found to be a tree like others, with some qualities that people like, and others that people do not. Paulownias are still sold – for their colorful flowers and for their extraordinarily rapid growth, and sometimes with the caveat that they can take over a yard. And they also grow on their own, in vacant lots and along train tracks, up on the roofs of buildings and also in their concrete capped backyards, in all these places and many others, they come up on their own, without help from the hand of man or woman. You can look out the window of a train going through North Philadelphia, you can look out the window of the El as it goes through Kensington and Frankford, you can look out the window of a car as it goes along Benjamin Franklin Parkway, at Logan Circle – through all these windows, in all these places, you can see the Paulownia; and at Cloverly Park, in Germantown, there is an especially large one, and there is also very large one at the Barnes Arboretum in Merion. 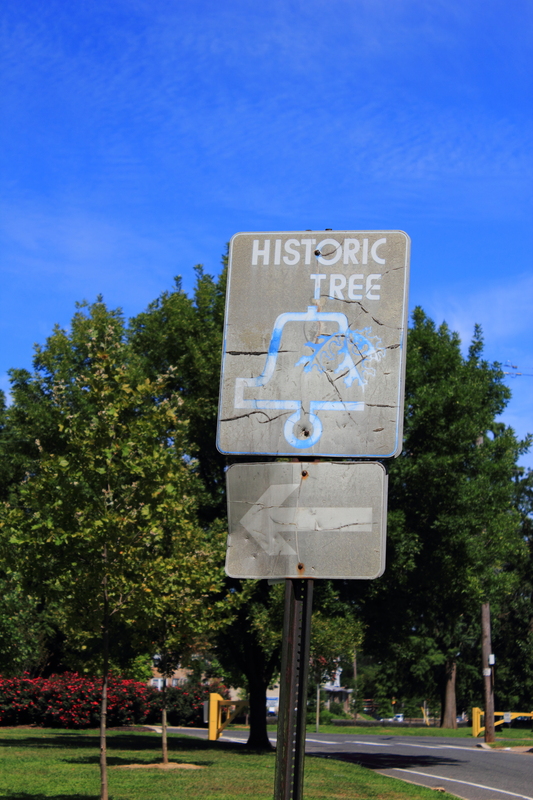 It is a very democratic tree, growing throughout Philadelphia – sometimes put where it is by us, sometimes not, but it is all over the place, either way. Seemingly sometimes everywhere, the Paulownia grows and does so regardless of whether we put it there, or not. Posted on March 20, 2012 by David H.
The Wagner Free Institute is in the midst of Philadelphia, surrounded by houses and stores and shops, surrounded by sidewalks and asphalt streets, surrounded by walls and roofs and other constructed pieces and parts – interspersed with vacant lots and parks, yes, where plants and non-human animals do grow and roam quite freely, but overall the ecology nearby is people . Temple University is just over to the east, the Broad Street line is about a 5 minute walk away, and people are just about everywhere, walking and talking all around. This isn’t, perhaps, where you’d expect to find a historic landscape, and most wouldn’t look for one here. But it’s here. In the yard of the Wagner are some very large trees – London planes (Platanus x acerifolia, we’ll call them) and silver maples (Acer saccharinum) are the largest that are there. They ring the yard and just from their size you can see they’ve been there for a pretty long time. But just how long have they been there and where did they come from? The first question, as to how old they are, is reasonably straightforward to answer. To find out how old a tree is, you either cut it down and count its rings, or you take out a sliver of it and count the rings you’ve sampled by doing that. The latter leaves the tree standing, so we did that for some of the trees in the Wagner yard. And we were able to do this because plants keep their history a bit more readily than humans do. Plants are not like people. As we (people, that is) grow, we continually regenerate and renew our cells. There’s turnover of bone cells and sloughing of skin, so that even though there are some parts that remain, we are a perpetual agglomeration of old and new. Plants, however, grow by accretion – new cells are laid down on top of the old, and the old ones aren’t done away with to make way for the new. They just get covered over and stacked upon. And this happens in all directions – plants can grow up, down and out. Herbaceous plants (plants that aren’t woody, that is) primarily grow up and down – they extend their axes towards the sky and via roots through the ground. Trees and shrubs (woody plants), however, while they do grow up and down, just as herbaceous plants do, they also expand outwards, adding layers outward in ever widening concentric circles, every year adding a new ring, on top of the old, covered with the new. And so, we can count those rings – and if we have a corer, we can do that with little harm to the tree. A corer is a machine, a simple machine, in the sense that it simply changes the direction and magnitude of the force applied to it (the definition of a simple machine that you may or not remember from high school physics). It has a screw tip end, a bit, that is attached to a long hollow stem. At the far end of that long metal piece (these can be of varying lengths, by the way – we used an 18″ corer at the Wagner), is another metal piece, at a 90° angle to the stem. This provides a grip and more importantly provides the leverage that allows one to turn the stem – to provide torque, if you will. You turn the corer, it drives the bit into the tree, and because the stem and bit are hollow, this cuts out a long narrow piece through the tree, a core that you can then pull out of the corer, mount on another piece of wood for stability, sand down, and then count the rings that were laid down year after year by the tree. Ned Barnard, tree corer non pareil, and I and a crew from the Wagner did some coring at the Wagner in October of 2011. (I should say that I use the words “I” and “work” together somewhat metaphorically – Ned and the others did the vast majority of the work, as is generally the case). We cored a silver maple and one of the London planes (since the other London planes were roughly the same size we only cored one of them) – then Ned labored over them, mounting them and sanding them, and then counted their age lines. It turns out that both of those trees were in the range of 110 or 115 years old, and so this gave us a target date to use to search the Wagner’s records, to try to find out where these trees had come from. And so I got to take a look at the Wagner’s old meeting reports, access to which was kindly granted by the Wagner, via Lynn Dorwaldt, librarian and archivist of the Wagner. Since we’d dated (by coring) the silver maple and London plane in the yard to about 110 to 115 years old (with a lower bound of 110 years), I looked at the 1890s-1901 records. 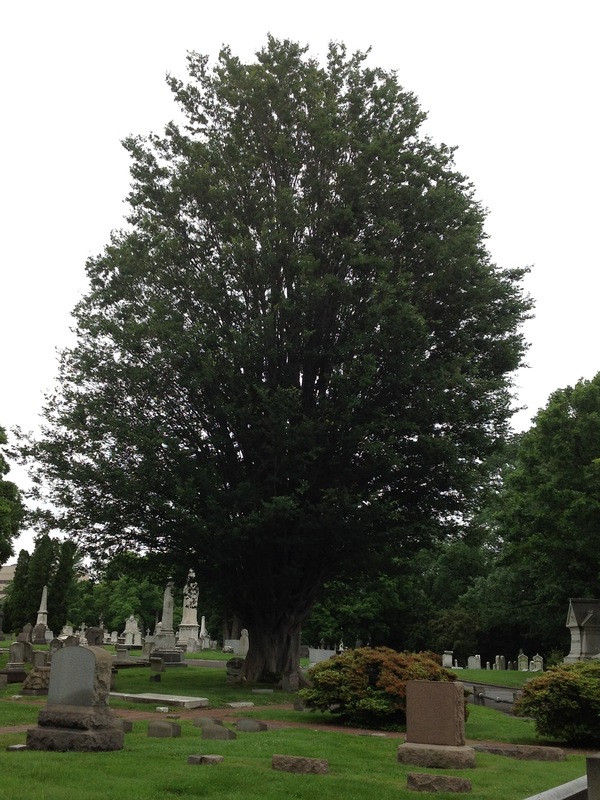 And it seems that the trees we cored most likely came from Meehan’s nursery, in Germantown, Philadelphia. In the meeting report (of the Wagner) of the 3d January 1900 , there’s mention “that the actuary prepare a scheme for planting young trees”, this is followed by the report of the 7th of February 1900, which says “That the actuary be authorized to consult with Mr. Thomas Meehan as to a scheme for the treatment of the grounds around the Institute”. This scheme was approved at the meeting of the 7th of March, 1900, and was “revised by Mr. Gridland” (as per the 7 May 1900 report). Things moved quickly, at the turn of the last century. In the Wagner archives, Ms. Dorwaldt found a letter from Thomas Meehan (dated 22 February 1900) where he mentions that he’s been ill and doesn’t do much day to day work with the business (the nursery, that is) anymore, but that his son’s handle that work – he also mentions that he’d help out with the landscape plan. Meehan died in the autumn of 1901, so the Wagner yard may well be the last landscape that he worked on. There’s a receipt from Meehan’s (dated 7 July 1900) for 12 trees – these most likely include those trees that are currently in the yard (the ones we cored, plus the other London planes). Don Azuma, of the Wagner, and I took a look in the yard, and it looks like, from the arrangement of the trees, that there might have been 12 in the original planting (though this still requires further confirmation, I should say). It looks like the planting would have been in three lines, to the east, west and south of the building (respectively) – there’s a depression in the soil at the southwest corner that is probably where one of the trees was, and that marks where the west and south lines of trees probably met. There’s another depression west-adjacent to the SE tree, and that gives a good idea of what the original spacing of the planting would have been, if all the above suppositions are correct. An additional note of interest on the Wagner yard – in 1895, the Wagner wanted to re-do their landscape and asked Frank Day to do the design. Frank Day was an enormously successful architect of the late 19th and early 20th century, and he was also a founding member of the Philadelphia Botanical Club. He (Day, that is) agreed to do the Wagner yard in 1895 – but I don’t see evidence that he produced it. He was a pretty busy guy (for example, there’s a letter from him, written in the 1920s, in the archives of the Academy of Natural Sciences [access to which was generously provided by Clare Fleming, archivist of the Academy], where Day says he can’t serve on a committee because he’s too busy with his architectural work). Clearly the Wagner had had grand plans for the yard’s plantings and design (and they also wanted a greenhouse), but those plans don’t appear to have been implemented, and there isn’t evidence that Day had further involvement in the Wagner’s landscape. Ultimately, though, even though these majestic plans for the yard were not realized, as we know the yard was redone, with trees from Meehan’s – and this provides a useful piece of horticultural history, too. London planes and American sycamores and Oriental planes can be difficult to differentiate from one another – this is the case now, and it was the case a hundred years ago. And so, if we look at an old nursery catalog, for example from Meehan’s Nursery, how can we know if a tree listed as an American sycamore, or an Oriental plane, or a London plane actually is what they say they are? Well, we can look at a tree that came from Meehan’s, one that is still growing, for example in the yard of the Wagner Free Institute, and we can identify it – if we see that it is a London plane, then that is pretty good evidence that this nursery was selling London planes when that tree was planted. And since we know when that tree was planted, which we know from having cored it, we can say quite confidently that Meehan’s was selling London planes at that time. And so, from the trees in the Wagner yard, we are supplied excellent evidence that trees that Meehan’s was selling at the turn of the last century were, truly, London planes. And so, from evidence gathered in the yard of the Wagner and from these old nursery catalogs housed at PHS, it is clear that while London planes were being sold by Meehan’s, they were misidentified (or perhaps, rather, just “differently identified”), most likely as Oriental planes. History is everywhere, and so are plants. The two are intertwined, and even in the middle of the city they tangle together, and the one can tell us about the other, the trees can tell us what was there before, and what was there before tells us about the trees that are there today – and even though they may be layered over and it may take some digging and coring, they all have something to say, and they all can say it, if you just look.